Fire at Dockyard Chapel November 1881 continued. About 10.30, the flagstaff, upon which her Majesty's white ensign has proudly floated upon many an auspicious occasion, was burnt away at its base, and toppled over to the northward side of the edifice, but its conncection with the tower was still maintained by its supports. The police and sailors worked with unremitting engergy to subdue the flames, but their efforts were futile, and it was not until eleven o'clock that the fury of the fire seemed to abate. Previous to this, two accidents had occurred to those who were attempting to put it out. The engines, six in number, were stationed in the carriage-way between the south side of the chapel and Naval Terrace, and ladders were placed against the walls of the edifice for the men to work with the hoses. One of these ladders gave way, and precipitated Mr EcEwen, the boatswain of the Ducan, and a sailor to the ground. The sailor sprang up comparatively uninjured and worked with as great vigour as before, but Mr EcEwen had two of his ribs broken by the fall. He was at once conveyed to the sick-bay at the Royal Naval Barracks. We are glad to say he is progressing as favourably as can be expected. Police-Constable Hughes, of the Metropolitan Force, also sustained slight injuries by falling from a ladder, but not sufficient to place him upon the sick-list. even amidst events of the most serious kind the ridiculous element is seldom found wanting, and this occasion was no exception to the rule. Anincident occurred that caused some laughter at the time, but which probably saved the lives of some of those concered. It appears that a steward 'blue' was mounted at the top of a ladder working a hose, when half-a-dozen plucky 'sons of Nepture' essayed to ascend the same to assist. The quick eye of the police man at once revealed the imminet danger to himself as well as to them, the ladder not being fixed firmly enough to bear the addition strain, and it being almost impossible to make them hear through the noise of the wind, and the roar of the flames, he turned the hose upon them, this at once had the desired effect for they descended the ladder with the agility of cats, little the worse we hope for their drenching. About eleven o'clock there was a general departure of the great crowd surrounding the building, as the fire was diminishing in its fury, and it was hoped that all danger was at an end. But a terrible event was about to happen. For some time, a number of men had been stationed in the cloak room of the officers entrance on the north side of the chapel working the hoses with considerable effect, but at last they were compelled to beat a retreat as the burning material was constantly falling in their midst. They then directed their efforts from the same position outside the building, unconscious of their great peril. At midnight the parapet on the north side of the chapel, which had ben weakened by the falling of the roof, succumbed to the violence of the gale, and fell with a terrific crash to the ground. Sergeant Hopkins called out to those who were working with the hoses, but the poor fellows had not time to escape, and were knocked down by the huge pieces of masonry, and partially under the debris. Staff Captain Dathan, master attendant at the dockyard, who had observed the catastrophe, at once informed those at work on the other side of what had occurred, and a party of seamen ran to the assiastance of their unfortunate comrades. The first man who was rescued from the fallen masonry was John Kew, a seaman belonging to the Royal Navy Barracks. It was found that one of his legs was broken, and he was conveyed to the sick-bay, the poor man's cries of anguish on the route being most heart-rending. The limb was amputated on Sunday morning, and the sufferer experienced relief, but he had received other injuries even of a more serious character, and he expired about eleven o'clock the same evening. P.C. William Rosier, of the Metropolitan Force, was the next extricated. He was completely hemmed in with the stone and brick work, and susained very severe injuries. He was taken to the dockyard surgery, where he was attended to by Fleet-Surgeon Willis and surgeon Breton. Two of his ribs and his ankle were broken, and he also received some injury to his shoulders. P.C. Harry Chandler, whose shoulders and chest were injured, was also taken to the surgery. The rescuers had an even more mournful task to perform, for upon rolling away a great mass of stone-work, weighing several hundredweight, they discovered the remains of a youg man named Marsnew, a labourer in the dockyard, buried beneath. He was at once extricated from the debris, but life was found to be extinct. The injuries he received were of a most frightful character, the heavy material striking him upon the head, had literally smashed his skull. His remains were conveyed to the dockyard mortuary to await the coroner's inquest. Police-Constables Stone and Pierce, who were working on that side of the chapel at the time of the accident, had almost miraculous escapes. The masonry rolled against the former until he was surrounded on all sides, but when he was extricated, he was, to the surprise of his rescuers, found to be uninjured. P.C. Pierce was standing close to the wall with a hose, and the stone-work fell so close behind him as to force the hose from his hands. Notwithstanding this terrible incident, the courage of the police, sailors, and military was not in any way diminished, and they continued to pour water into the building until three o'clock in the morning, when their efforts were at last rewarded with success. Among the officers who were present, and assisted in the attempt to put out the conflagration, were Captain J.D'Arcy, Staff-Captain Dathan, Lieuts. Haszard, Morgan, and Chambre, R.N. Colonel C.W. Elgee, Colonel Still, Brigade Major Lloyd, R.A., &c., &c. Mr H. Vile, Master-at-Arms, Royal Navy Barracks, Chief Inspector Martin, and the sergeants of the Metropolitan Police Force, are deserving of a word of praise for their indefatigable exertions. The whole of the records of the chapel, some of which are of great antiquity, were saved through the courage of Mr Allison, the verger, who effected an entrance to the vestry at the south-west side through one of the windows, taking with him a hose to protect himself from the flames. The records and baptismal registers were in a double iron safe, and after some difficulty he succeded in unlocking the Admiralty portion of the same, and passing the documents through the window to a naval officer outside. He was unable to obtain the military registors as he did not process the key, but these were removed on Sunday morning from the safe, which was uninjured. Mr Allison also saved the communion plate, but in his anxiety to pass the vessels out of the vestry, he drooped one of them. This, however, was found, slighty dented, beneath the rubbish on Thursday morning. Just before Mr Allison's task was completed, a 'Jack tar', belonging to the Wye, made his appearance in the vestry, and with his help, even the minister's surpices were saved. Mr Allison is to be congratulated upon the coolness and presence of mind he displayed under such hazardous circumstances. Fire at the Dockyard Chapel. On Saturday evening last the town was thrown into a state of great excitement and alarm by the breaking out of a fire at the Dockyard Chapel. The evening was one of the worst which could possibly be imagined for a fire to take place, there being a violent gale, from the south-west, approaching at times to the proportions of a hurricane. Although the storm was accompanied by drenching showers of rain, no sooner was the alarm given, than crowds from all parts of the town were seen flocking to the scene of the conflagration, and in less than an hour from the time it was discovered, some thousands of persons were on the spot, the pavement between the Sailors'Rest and the Moat, and the two approaches to the edifice from the Barrier Guard, being thronged with an agitated multitude. The excitement in some parts of Marine Town, where the Chapel could not be observed, was very great, the lurid glare in the heavens seeming to indicate that a fire had broken out in the immediate locality, and persons might have been seen running from door to door arousing their neighbours. It appears that about seven o'clock information was given to the police at the main gate by the military, that sparks had been seen issuing from the Chapel. Acting-Inspector Chubbock at once obtained the keys and visted the building, examining every part, but could find no trace of fire. The fire of the heating apparatus seemed to be burning as usual, and he left the place feeling that all was safe. A similar report was shortly after received, and the Inspector visited the edifice a second time, but could find no trace or smell of the terrible element that must have been at work in the roof. As a precaution he raked the fire out of the grate, and after watching outside for a quarter-of-an-hour without seeing any sparks or smoke, returned to the Dockyard, and was so satisfied that the edifice was safe, that he patrolled the yard to ascertain that all the men under his charge were at their respective stations. Before he returned to the main-gate from the "rounds" he observed flamed to be issuing from the south-west corner of the Chapel. The information that the fire had broken out was conveyed to the main-gate by the military authorities about 8.45, and Chief Inspector Martin at once ordered the fire engines to be taken to the Chapel, and summoned all the constables on duty from their respective ststions. He also sent a message to the Royal Naval Barracks for assistance, and to the man in charge of the 50-horse engine at the well, to commence pumping. In a very short space of time a goodly force of police and seamen arrived upon the scene with their engines and hoses, and at once set to work. The military were also called out, and a party of men were told off to watch the powder magazines, which are within three hundred yards of the Chapel. Meanwhile the fire had spread with tremendous rapidity along the roof, and got a firm hold on the building before any effort could be made to subdue it. Assoon as practicable the hoses were fixed to the hydrants and fire plugs in the neighbourhood of the edifice, and although a copious supply of water was obtainable, the pumping being done by the 50-horse power engine, in the Dockyard, the fire, fanned by the elements outside, raged fiercer than ever, and burning materials falling from the roof ignited the lower part of the Chapel. It was not long before the roof fell in, and then the four walls of the edifice appeared like an immense furnance, defying all efforts to extinguish it. This was especially the case when the front doors were destroyed, and the burning mass was observed throught these apertures. In little more than half an hour, the devouring element had extended to the tower, and shortly afterwards the clock, by which the time of the inhabitants has been regulated for so many years, ceasd to beat. The flames playing in and about the louvres of the tower presented a striking spectacle of beauty; now, during a temporary lull in the gale, they shot upwards, while other tongued of flame, caught by a sudden blast, swept downwards, and seemed to embrace each other as if in mocking sport. By ten o'clock the conflagration had reached its height, and had extended to the whole of the building. The louvres in the belfry having been destroyed, revealed two bells, which were watched with intense interest by the spectators, but the tough piece of timber to which they were suspended at last gave way, and the bells fell into the seething flames below. They were found in the debris on the following morning, one of them being partially melted. The sight was magnificent whilst the conflagration was at its height, and the wildness of the evening only served to increaseits grandcur. The sparks, and at times large pieces of burning timber, were carried by the force of the gale over the soldiers barracks, and fears were entertained lest any of the lighted pieces might be blown through the windows, and thus extend the conflagration. Fortunately, however, the fire was confined within the four walls of the Chapel. From Sheerness Times and general Advertiser Sat 3rd Dec 1881. It was a `Commissioned' Church, not a Consecrated one and was used by dockyard/service personnel, which is probably why nobody wanted to take it over as a Church after the fire. My father worked for the Admiralty, although we didn't live in the Dockyard, and we used that Church. My mother belonged to the Mothers Union there also, but I don't know if there were any limits on who could worship there. Thinking back, I seem to remember several people who were not (as far as I was aware) connected to the Dockyard, worshipping there. Pembroke Marsnew, aged 21, Dockyard labourer, Sheerness. John Kew, age 25, Able seaman RN, died of injuries nearly 24 hours after being rescued. The inquest was held on the afternoon of 28th Nov 1881, at the Fountain Hotel. Foreman of jury, E J Penney. The jury viewed the bodies and inspected the remains of the chapel. "On Saturday evening last, a fire broke out at the Dockyard Chapel, and the deceased, Pembroke Marsnew, together with other men, were assisting to put it out. About 12 o'clock, the parapet and a quantity of the wall on the north side of the building fell down. I cried "look out", and afterwards saw a policeman fall down, but he got up and walked away. I then went to see if anyone was underneath the debris, and found Kew lying with a lot of stone and brick-work on his leg. He was released, and conveyed to the surgery at the Royal Naval Barracks. After assisting two constables named Rosier and Stone from their perilous position, I found Marsnew almost buried beneath the stone and brick work. I extricated him, but he was quite dead. His body was taken to the Dockyard surgery. A heavy gale was blowing from the south-west at the time, and the fire had gained quite a mastery over the building. The deceased volunteered to assist, and a short time previously had been working with a hose. I cannot say what he was doing at the time of the accident." The Coroner then reviewed the evidence, and said that it was not within the province of the jury to consider how the fire originated, that it would be for some other authority to investigate. It was plain that both men went there when the fire was raging, and that in assisting to put it out, they had received injuries which resulted in their death. The jury were called upon to decide whether their death was accidental. The jury returned a verdict of "Accidental death from injuries received by the falling of a portion of the wall of the Dockyard Chapel during the fire." Both men were buried in the Isle of Sheppey cemetery on the afternoon of Wednesday 30th Nov. Source: Sheerness Times and General Advertiser, Sat 3rd Dec 1881. Was it only for dockyard/service personel? I'm sure Mum had said some of her family were christened or married there (lived School Lane Bluetown). As far as I am aware there has been no work on the church although it was fenced off. "In 1884 the nearby Dockyard Church was ravaged by fire, it was later refurbished - however this church was closed in 1970 nd when this happened the altar and some wooden panelling were moved to Holy Trinity Church, which you can still see today." I believe that the organ (undated) built by Hill, Norman & Beard, was removed from the church prior to 1970 and installed in the Maidstone Prison Chapel where it has been rebuilt and enlarged. As far as I am aware it is still there. I quite agree with all the comments made about The Dockyard Church. I was married there on Boxing Day 1950, the Church looked grand being decorated with holly, etc. My granddaughter seeing a photo of the inside remarked what a beautiful place so bright, that seeing the remains now, cannot understand how this could happen. Why do we have to lose our treasures? Even the well built buildings that were in the Dockyard, also offices, would have housed so many people with some foresight. 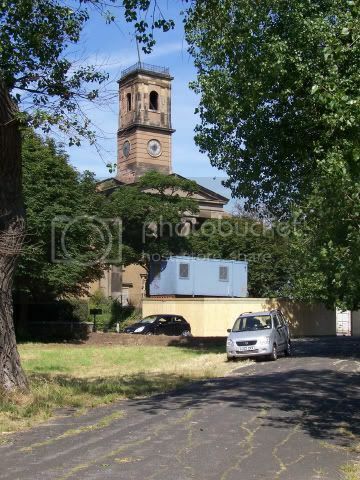 It is enough to make one feel physically sick when viewing the photos of the once beautiful dockyard church in Sheerness; (as good as the photos are.) In 1952, I was confirmed in that church and remember feeling totally in awe of the beautiful interior and spiritual atmosphere. I am quite distraught by the way in which our local council has allowed this building, and several others, to fall into the wrong hands. They are just about to repeat the same mistake. They seem completely oblivious of the fact that The Isle of Sheppey could have benefited hugely, and not only economically, by preserving the island's wonderful heritage. All the relevant societies, including Heritage Sites at Risk, need to move in fast before the key to the island's regeneration is handed over to those who know nothing of its value. There are plenty of opportunists out there waiting to stick a knife into the heart of an island that deserves better and however much locals fight back, I think we are on a loser. However, we must never give up the fight. Looks like they are about to start working on Dockyard Church. Unfortunately nothing the owner proposes is appreciative of the history surrounding the building. Although, it seems it may well be made into a museum in the future! What a wonderful building - how can they leave it like that!